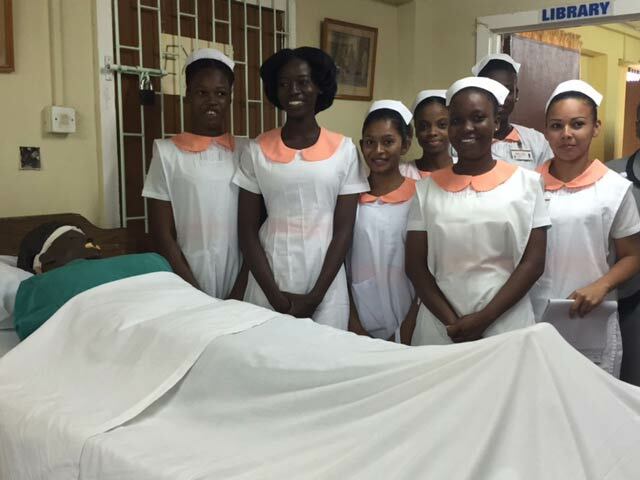 The School of Nursing and Health Studies’ PAHO/WHO Collaborating Center offers sustainable nurse educator training and health care workforce development to students in Guyana. UM News sat down with Mary Mckay, associate professor of clinical and associate dean for undergraduate programs at the University of Miami School of Nursing and Health Studies, and with Deborah Salani, assistant professor of clinical at the School of Nursing and Health Studies, to learn more about SONHS’s collaboration with the Pan-American Health Organization/World Health Organization (PAHO/WHO). The collaboration strives to enrich education and training for nurses and nurse educators in Guyana, a South American country that is culturally connected to the Caribbean region and is considered part of the Anglophone and “mainland” Caribbean. UM News: How and why did the UM School of Nursing and Health Studies (SONHS) begin offering nursing education consultation and a certificate of nursing education in Caribbean countries? Mary Mckay: In 2008, SONHS was designated a Pan-American Health Organization/World Health Organization (PAHO/WHO) Collaborating Center, one of only ten such centers in the U.S., a designation renewed in 2016 by PAHO/WHO for another four years. As a Collaborating Center, our School commits to working together with PAHO/WHO to achieve its goals, including increasing nursing workforce and nursing education capacity in Caribbean countries. SONHS partners with health ministries, PAHO/WHO sub-regional offices, nursing schools and hospitals throughout the Caribbean to design and implement sustainable methods to teach nursing and deliver care using “best practices.” A highlight was hosting leaders of nursing education for a two-day workshop during summer 2016. Representatives from 18 Caribbean island nations traveled to Miami for a seminar targeted at achieving nursing education reform, including standardization of nursing curricula and nurse educator competencies, and common accreditation requirements across nursing schools in the Caribbean region. Nurse education students in Guyana taking an exam as part of the hybrid certificate program in Guyana offered through the SONHS and Pan-American Health Organization/World Health Organization (PAHO/WHO) Collaborating Center. 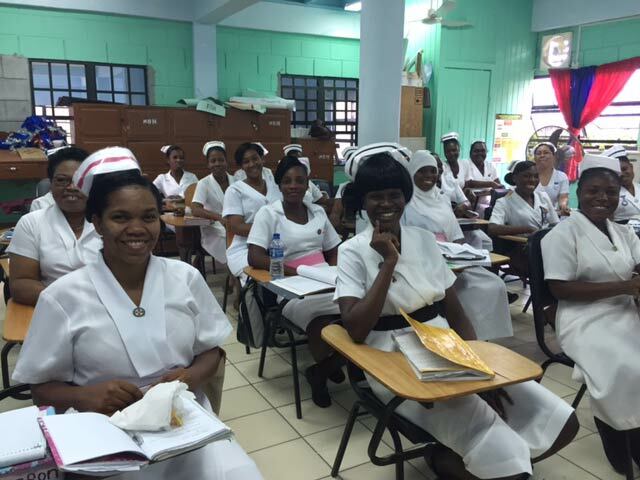 One of our Collaborating Center’s most exciting activities to date is the hybrid Certificate in Nursing Education program for Guyana’s nurse educators. In Guyana, nursing education is overseen by the nation’s Ministry of Health and, as in many Caribbean countries, there is a severe nursing and nursing faculty shortage due to the “brain drain” of professionals immigrating to the U.S. and other first-world countries. The aim of our four-course certificate program is to help alleviate this shortage by teaching participants to deliver quality nursing education using best practices and by building their capacity to train other faculty. In turn, this helps increase the pool of teaching faculty and promotes systemic and sustainable improvements in Guyana’s nursing education infrastructure. Deborah Salani: Professor Mckay and I strongly believe the partnership with SONHS and PAHO/WHO can increase nursing capacity in Guyana and prepares the country’s next-generation nursing workforce to deliver high-quality, safe and competent patient care. UM News: When did the collaboration begin and how did it progress? Mckay: In 2015, in preparation for launching the course, SONHS first hosted two delegations from Guyana—the directors and senior nurse tutors—from the nation’s four nursing schools. They were able to learn about U.S. nursing education methodologies and to observe clinical instruction in action during visits to SONHS’ community partner hospitals, and compare these with Guyana’s delivery of education and clinical teaching for aspiring nurses, which is very different. The delegation also observed nursing education strategies used by SONHS clinical faculty to bridge didactic and clinical content. We emphasized the connection between clinical instruction and classroom learning. The directors and nurse tutors attended and participated in simulation activities. Then, we mentored 26 Guyana nurse educators teaching in Guyana through the hybrid certificate course, which ran from November 2015 to June 2016. Preliminary evaluations indicate the course is already impacting Guyana’s nursing education community. Guyana nurse faculty report that they are identifying their strengths and weaknesses and are integrating a variety of innovative teaching strategies into their work as nursing educators. Nurse education students during a lecture as part of the hybrid certificate program in Guyana offered through a collaboration between the UM School of Nursing and Health Studies (SONHS) and the Pan-American Health Organization/World Health Organization (PAHO/WHO). Nurse education students during hands-on training as part of the hybrid certificate program in Guyana offered through a collaboration between the UM School of Nursing and Health Studies (SONHS) and the Pan-American Health Organization/World Health Organization (PAHO/WHO). 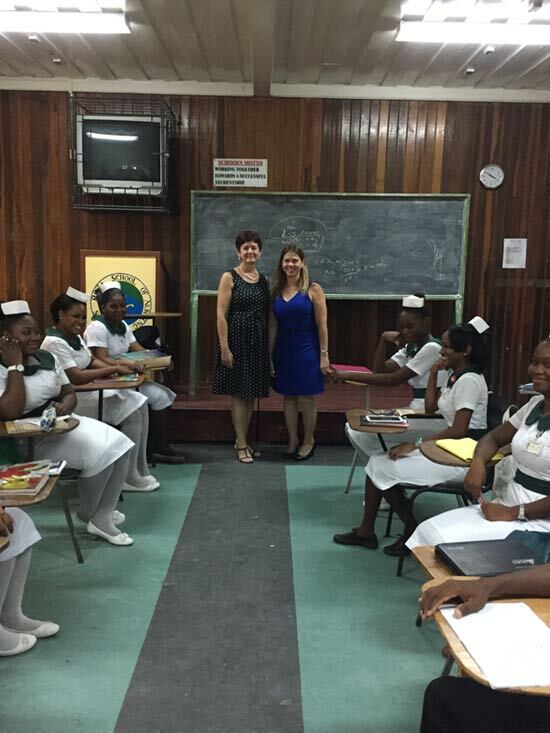 Deborah Salani, left, and Mary Mckay (both standing center) provided on-site training during four lectures for students in the hybrid certificate program in nursing education for Guyana’s nurse educators. Salani: From the beginning, we employed culturally appropriate strategies. We first conducted a baseline assessment of the Guyana nursing tutors’ educational needs and used this data to customize course content to specific challenges facing nursing education in Guyana. We worked within their system. Our goals included empowering the nurse educators so they would gain a new and useful perspective on nursing education methods and evaluation measures. In addition to focusing on the theory and principles of nursing education, we taught the Guyana nurse tutors how to develop tools to customize their own curricula. Dr. Mckay and I delivered a weekly e-lecture to course participants and traveled to Guyana four times to conduct on-site training. During the last visit, Dr. Mckay and I observed and graded course participants’ final projects, which was to design and conduct their own innovative teaching strategies. UM News: What was the most meaningful part of this experience? Salani: We were pleased to see the tutors’ enthusiasm and passion for learning and their willingness to embrace technology utilized with the online hybrid model. The tutors’ progression from utilizing traditional teaching methods to more progressive methods that increased student engagement was rewarding. Mckay: I was very impressed with the level of dedication to this project from all of those involved, including the Guyana Ministry of Health officials, the PAHO/WHO Guyana office, tutors and staff. Prior to my involvement with this project I did not know much about the Guyanese culture. I now have a much deeper understanding and appreciation for the culture. The partnership between UM SONHS, PAHO/WHO, Guyana’s Health Ministry and the country’s nursing school directors and educators demonstrates the success of strong collaboration and understanding.